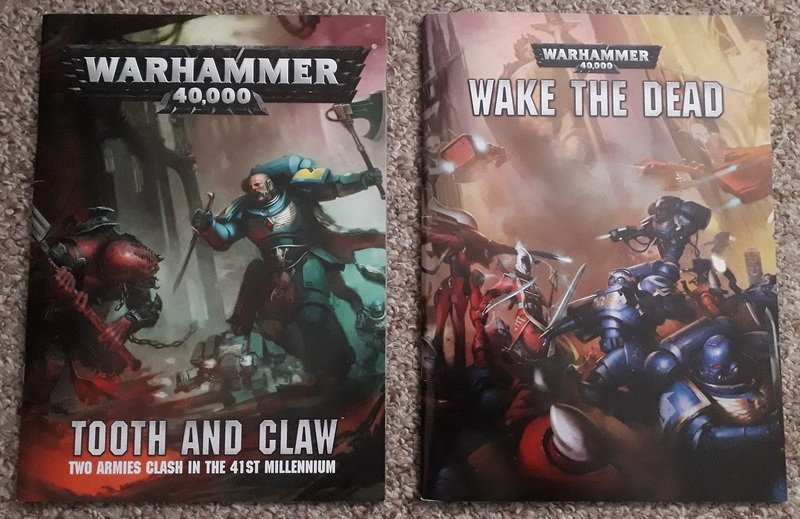 I’ve been reading up on the current campaign in Warhammer 40k-land, which has been quite an interesting way to spend the run-up to the festive season, so thought it a great time to share some of my thoughts with you all as we see the 40k storyline gearing up for something quite spectacular! Vigilus has been looming large in the lore since the dawn of the Great Rift that split the galaxy in two at the onset of 8th edition. For the uninitiated, as 7th edition drew to a close, we saw the three Gathering Storm books at the start of 2017, each focusing on some fairly cataclysmic events in the lore such as the Fall of Cadia, and the rebirth of Roboute Guilliman. At the fall of Cadia, a massive warp rift opened across the entire galaxy – the Cicatrix Maledictum – engulfing many systems entirely, and splitting the Imperium in two. To the galactic north lies the Imperium Nihilus, where the Blood Angels are almost cut off from the rest of the galaxy, left to hold back the darkness while beset by Hive Fleet Leviathan. Crossing the great rift are a small number of small corridors, the most stable of which is the Nachmund Gauntlet. At the key point along this corridor is the world of Vigilus, a world that has been beset by internecine squabbling between the Adeptus Mechanicus and the Adeptus Ministorum, the governing bodies of the planet who cannot agree who is more important. When the great rift opened, both sought aid from the Imperium, and the Ministorum’s insistence on any military aid being deployed to the cathedrum districts has further deepened this division. From out of the warp rift has emerged the ramshackle fleet of an Ork Speedwaaagh, which crash landed on the planet and has since claimed the desert spaces between the hive cities of the Imperium presence on the world. Water is scarce on the planet, and with nothing else for them to fight out in the desert wastes, the Orks have taken to high-speed racing out there – you know, as you would. Control of the scant water reservoirs on the planet has been taken by the Genestealer Cultists of the Pauper Princes, who have emerged earlier than planned in response to the Ork presence on-world. When the Space Wolves arrived thanks to being thrown off-course by the warp storms, they sought to eradicate the xenos taint from the world and began attacking the Cultists with vigour. 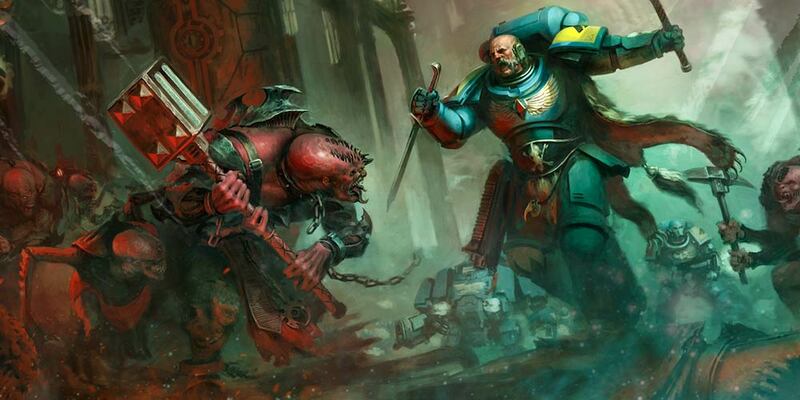 Tooth and Claw is the first official product to be released for the Vigilus storyline, pitting Space Wolves against Genestealer Cultists and seeing the release of a Space Wolves-specific Lieutenant, alongside the long-awaited Aberrant multi-part plastic kit, and the new Abominant HQ to lead them. The box was a really excellent release, saving a great deal for collectors of either army – it even had the full Redemptor Dreadnought kit! The booklet included in the box was also top-notch, including a lot of the background on Vigilus that read, for the most part, like the sourcebook for a Role-Playing Game. While we can usually expect to see some element of background for the armies in these sorts of releases, we also get a really in-depth look at the logistical structure of Vigilus – primarily because the militarised reservoirs are a major plot-point for the Genestealer Cultists in the box. The booklet also included all of the datasheets (including points values) for the models, and some missions that allow you to play along with the narrative included in there, and in true 8th edition style, there are unique stratagems included that help along the way. It all adds up to a really great bundle, and a worthy first step on the road to war-zone Vigilus! The next box to be released came pretty much out of nowhere – I certainly wasn’t expecting to see something like it released so soon after the first, at any rate! Pitting Ultramarines against Eldar, I have to say that this one felt a little more like a cash-grab, following the same formula but including only a new Eldar Spiritseer and yet another Primaris Lieutenant, alongside a bundle of existing miniatures that didn’t really feel like anything special. Wake the Dead did not, therefore, bode well. That Spiritseer is a lovely model, though! 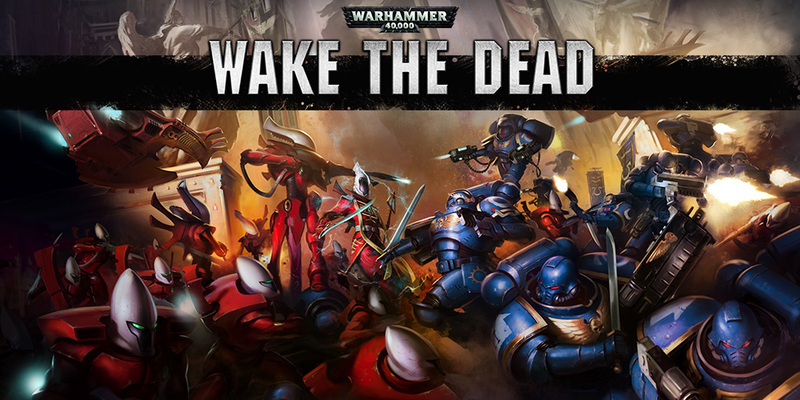 The lore for Wake the Dead, however, was another matter! 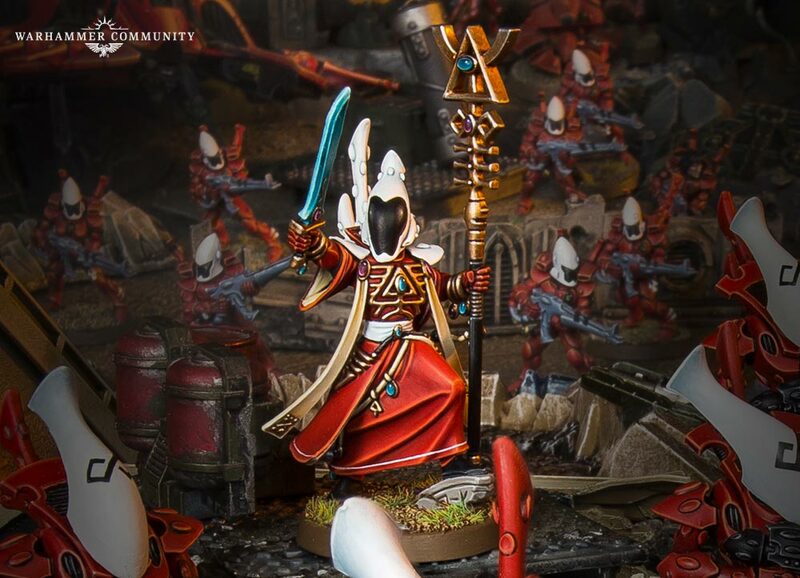 The Eldar have long had their eye on Vigilus, as their Seers have discerned the skeins of fate converging around the planet, beset as it is by Chaos warp-storms and raiding parties of Dark Eldar. When they see the Chaos Cult demagogue Vannadan the Firebrand inciting the populace to turn to the Dark Gods, the Craftworld of Saim-Hann sent a delegation to eradicate this threat. While they are successful in their objective, the 47th Antrell Lions squad of Tempestus Scions proceeded to slaughter almost the entire Eldar force, mistaking them for their Dark kin. 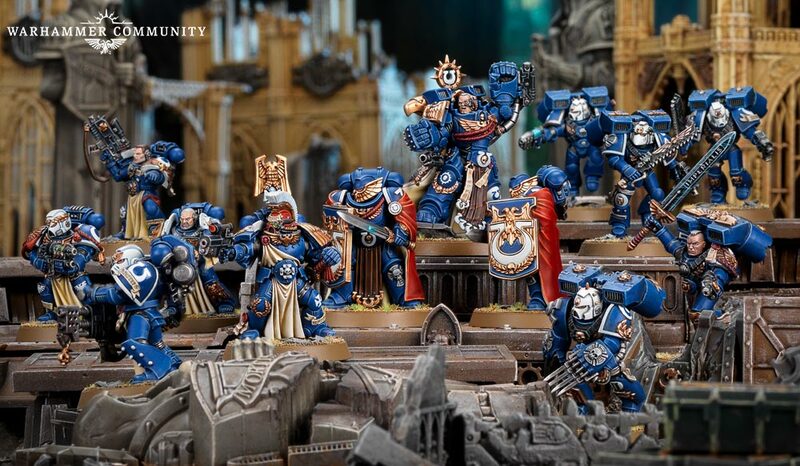 Meanwhile, Chief Librarian Tigurius has seen the world of Vigilus at the start of a swathe of bloodshed that will reach Terra itself, and so an Ultramarines task force is dispatched to the beleaguered world, headed up by none other than Marneus Calgar himself. Calgar dissolves the ruling council of Vigilus, and installs his own Senate to rule the world during this time of crisis, with himself at its head. One of the survivors of the Scions’ purge was Spiritseer Qelnaris, who promptly returned with a strike force to avenge his fallen warriors on the blinkered Imperium. Qelnaris’ attack is answered by Calgar and the Ultramarines, who at first attempt a diplomatic resolution to the conflict following the Space Wolves identification of the Saim-Hann warhost as fomer allies. The overtures are rebuffed by the Spiritseer, however, who has sworn a blood vendetta against the fools of the Imperium. The box set may have been underwhelming in comparison to its predecessor, but the lore is incredible and really helps to paint the picture of a fiercely-contested battleground that is rightly at the forefront of the current campaign storyline. The storyline is rich without being convoluted, helped in part by the decision to only include those factions that feel most relevant. Tau and Necrons are notably absent, and I think this is fine (despite these being two armies I collect). Previous campaigns from 7th edition have really benefited from being on something of a smaller scale – Shield of Baal only involving Blood Angels and the various Imperium factions, Tyranids and Necrons felt fine because it wasn’t too cluttered, for example. 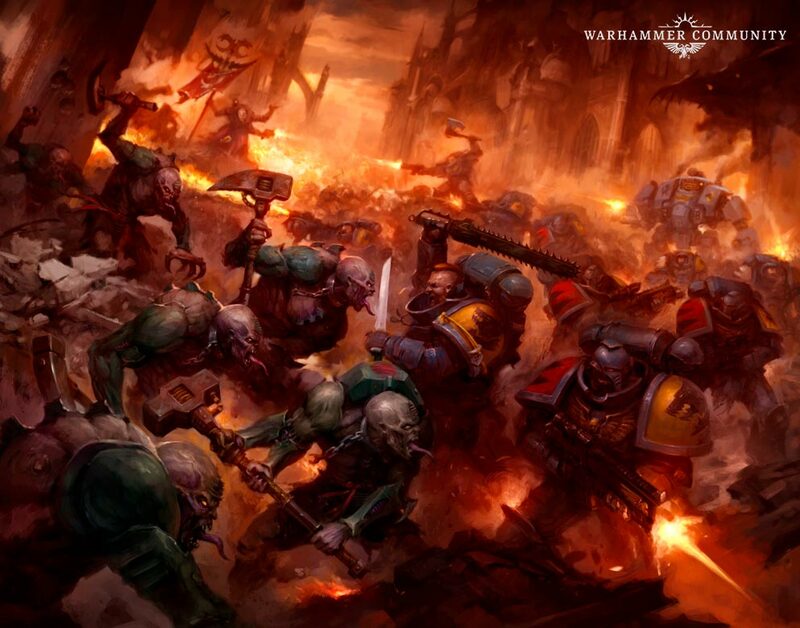 Of course, the Imperium side of things can lead to all manner of bits and pieces going on, and on Vigilus we already have several Chapters of Space Marines making a name for themselves alongside the Ministorum and Mechanicus, with a very definite presence from the Scions. The Imperium side of any conflict is always going to feel a bit full, due to the nature of the beast. With Marneus Calgar on the world, we’re now poised on the brink of the new campaign book, Vigilus Defiant, which is the first in a two-part series that will chart the war-zone as the Imperium clashes with the Orks, the Genestealer Cults and the Craftworlds. While there are Dark Eldar raiding parties mentioned multiple times in the lore so far, we’ve not got anything further on that yet, and I’m really pleased that Vigilus hasn’t turned into a Tomb World for Anrakyr or someone to come along and re-claim, or the Tau to attempt to expand into this particular area of space. There’s plenty of time for the other armies to be catered to, after all! Make sure to check back later in the week, when I’ll be looking through the new campaign book, and seeing what it has to offer us! Previous Previous post: Off for the holidays! Next Next post: Hobby Progress, week three!